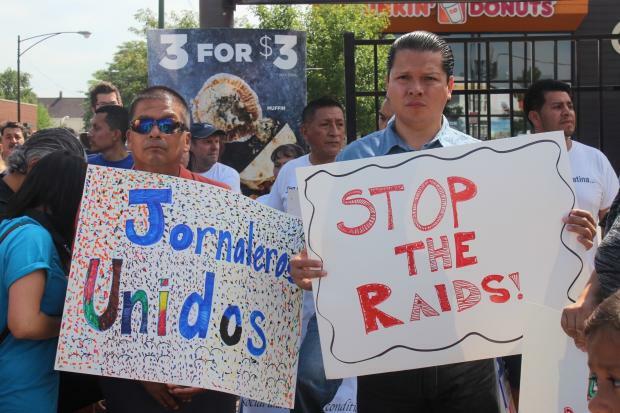 AVONDALE — Enraged by a recent immigration crackdown on day laborers, Latino organizations and Ald. Carlos Ramirez-Rosa (35th) are calling on the city to take a stand. Ramirez-Rosa called on the city to cut ties with the U.S. Immigration and Customs Enforcement agency and joined activists in accusing agents of racial profiling and illegal searches that violate the Fourth Amendment. Around noon last Friday, an ICE special agent and an officer descended on a group of men standing near the corner of Belmont and Milwaukee avenues. 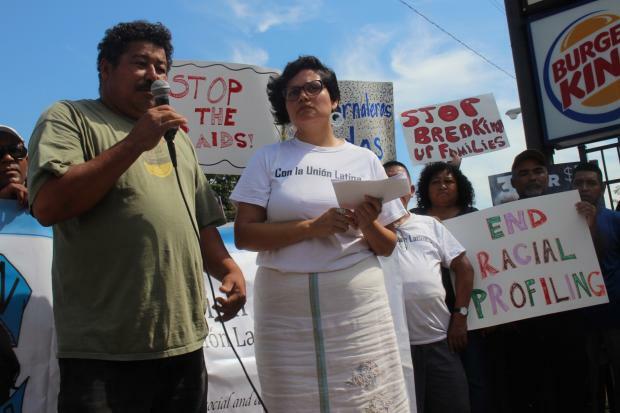 It was the fourth recent raid focused on sites where day laborers often gather, activists said. For Aristides Banegas, work site raids have become a frightening reality after 23 years of finding work at Belmont and Milwaukee. Banegas sends his wages home to his five children in Honduras and lives in the United States legally, he said. He can't imagine how he would find regular employment otherwise, he added. But over the last three years, Banegas said immigration agents began showing up to check papers. "I'm saying this is wrong. We're here to look for work, to pay for rent," Banegas said in Spanish. "I would like to ask all public officials who speak on our behalf: As a day laborer, I ask for better treatment." On Friday, agents demanded Banegas prove his legal status. He said he saw them question his friend and another worker and use a fingerprint scanner before cuffing their arms and legs and taking them away. "It was a moment where you could see how you could lose everything," Banegas said through a translator. The Chicago agents were targeting gang members during the Friday raid, an ICE spokeswoman said in a statement. The operation was in line with the agency's focus on gang members and convicted criminals, which is why one of the three men was later released, ICE said. A spokeswoman for #Not1More, a national campaign which fights what it considers unfair immigration policies, disputed the allegations, saying the three people who were detained were not involved in gangs or arrested for gang-related issues. Marco Mendoza said police took his fingerprints and detained him for three days before he was let go on Monday, despite his having temporary protected status. Nationals of countries with ongoing wars or environmental disasters can receive the designation, which prevents their deportation and can grant them employment documents and travel authorization. "They told one of the guys that he was an 'illegal' and had no right to be here," Mendoza said. "Then they handcuffed us. I told [an agent] I had my state ID, but it didn't matter." Told ICE didn't process arrestees on the weekend, Mendoza was held for 71 hours, he said. The Latino Union of Chicago , an advocacy group for low-wage workers, said the ICE agents violated the workers' constitutional rights, citing federal rulings that found a "Hispanic-looking appearance and presence in an area where illegal aliens frequently travel are not enough" for seizure. "This is a grave violation, and an example of the racism that drives this country's immigration policies," said Analía Rodriguez, director of the Latino Union. "These workers' rights were violated — there's no other name for government agents targeting a traditional gathering place for Latino men." The Latino Union has asked the Department of Homeland Security to open a civil rights investigation. 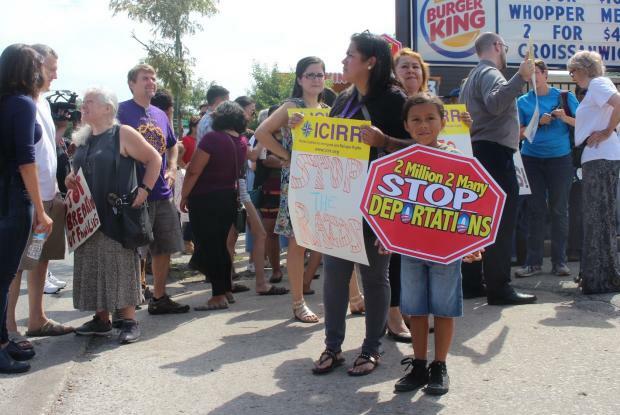 Along with Organized Communities Against Deportations and the #Not1More campaign, it's also calling for ICE to stop using the fingerprint scanners and looking into whether the Chicago Police Department had any role in or advanced of the street corner raids. In June, CNN got a firsthand look at ICE investigations in Chicago that use the new handheld fingerprint scanners. Last year, ICE said it shifted priorities, targeting convicted felons, national security threats and people crossing at the border over noncriminals. Of those removed from inside the country, 91 percent were convicted criminals, ICE reported. The 235,413 people deported in 2015 marked a 25 percent decrease from 2014. It was also the lowest numbers in eight years of both total deportations and removal of noncriminal immigration violators, according to a Homeland Security report. More state and local officials are declining to work with ICE operations, as well. Both Chicago and Cook County have refused the cooperate over the last decade through enacting sanctuary ordinances, although activists have accused police of doing so anyway. Speaking to a crowd of about 50 people Tuesday, Ramirez-Rosa said the public scrutiny of presidential candidate Donald Trump and his immigration proposals should also zero in on President Barack Obama. Since Obama took office in 2009, ICE has deported 2.5 million people. "I'm here today to say our city rejects the presence of Immigration and Customs Enforcement in our community," the alderman said. "Our city will said no to raids and no to ICE picking up people in our neighborhoods."